When I’m reading the aura, I generally find spirit guide energy above the client’s head. Assigning a specific area of the aura to ‘the colours of spirit guides’ is helpful because then I can discern spirit energy from the energy of any incarnated beings the client might be interacting with. 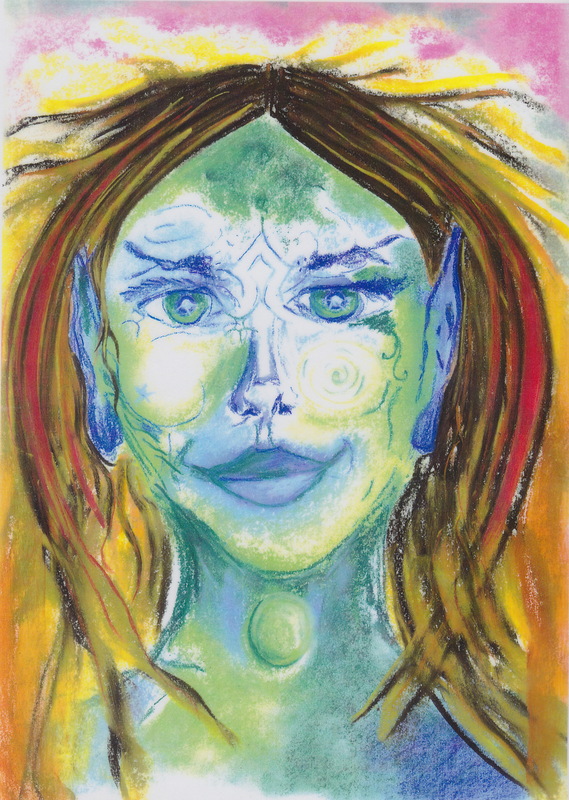 Using the area above the head as the spirit guide area makes sense because this is the area governed by the crown chakra, our spiritual chakra. I tend to see spirit guides as balls of coloured light, with the colour, positioning and size of the ball giving me information about the guide’s personality and purpose. These meanings are my own personal system, and certainly not a rule of thumb- everyone perceives energy in their own unique way. I like the ball of light idea because to me, spirit is energy…the image of a guide as a character or human is secondary to the idea of spirit being an energy field. Larger balls generally represent ‘older’ or wiser spirit guides. White balls are ‘master’ guides- guides with a very high frequency. When a ball of light is touching on, or close to the body, it means the guide and human have a very good working relationship and have probably been together for a long time. Guides are attracted to us and connect with us on the basis of shared personality traits, interests and goals. Guides have many reasons for connecting with humans. Some guides are ‘working’ (ie guiding people is their spiritual work), others are simply making friends or reconnecting with old friends. Others are on a mission and the humans they choose to connect with are on the same mission. A red ball of light can represent a guide who will teach you how to manage your ‘fire’- eg your personal power, passions and energy. Depending on the exact shade and any accompanying colours, a red-coloured guide might be a martial arts teacher, a motivator or sports coach, an assertiveness coach, or a sexuality coach, to name just a few possibilities. An orange ball of light can represent a ‘lighten up’ guide. These guides teach us how to have a sense of humour and not take ourselves and life so seriously. They can be mischievous and exasperating, pushing our buttons in an effort to help us find the funny side of life. A slightly different shade of orange and the guide might be a counsellor, attracted to you perhaps because you need counselling or because you give counselling to others. Guides don’t have to be strictly personal or even human. We are all connected as one and we have access to all energies. I have many personal guides that are human in appearance, but most of these guides shape-shift into other forms, such as pure energy, or animals. I also enjoy working with what I call public guides. A good example of a public guide is the archetypal ‘mother’ energy which comes in many guises such as Mother Mary, Isis, Quan Yin etc. To me, these mother energies are often depicted as balls of sapphire blue light. Yellow balls of light can be sunny guides who uplift and inspire us, helping us develop confidence and a warm countenance. And if you like the idea of being guided by archetypes or public guides, a golden ball of light might represent a sun God like Ra or Apollo. Sometimes a ball of light will take on specific colours that tell me the guiding energy is an inner self, like the inner child, higher self or a creative inner muse. Another category is the past life guide. In this case the guide might be someone you knew from a past life, or it might be yourself from a past life. In the latter instance, the presence of this guide can help you tap into past lessons learned, or past skills and wisdom. When I am reading the aura, I almost always tune in to at least one animal spirit guide. The animal spirit guides I have recently connected with during aura readings include a starfish, a firefly, and a giraffe. Sometimes I will be guided to sketch the actual shape of the guide, as I did with the starfish, but mostly, they appear as balls of light. One energy that tends not to appear as a ball of light, is fairies. Fairies more often appear to me as sparks of light! When a spirit guide is a nature spirit, I might see a literal image of a mountain, tree, flower or the wind, but at other times the guide appears in a metaphorical fashion, personified as a fairy, elemental or magical being. Mountains, for example, can be personified as giants. A leaf might express itself as a tree dryad, a flower as a flower fairy and the wind as a sylph. I’ll never forget the time I looked at a child’s colours and said ‘Oh, you have a tree dryad with you- it looks like a boab tree’, only to be told they did indeed have a boab tree on their property. The same family, a few years later, was surprised when I spotted a giant in one of the children’s auras. The little girl immediately pulled a sulky face and her mother and grandmother looked at each other in amazement. Apparently, she had been consistently talking about a giant who kept following her around and she was frightened of him. I tried to reassure her he was friendly and suggested to the giant he back off a little! Is the giant real? Are any spirit guides real? Who knows. I certainly gain a lot of joy and very real benefit from my invisible friends and my clients experience the same. Sometimes my clients and I invent spirit guides for specific purposes, like the time we created a personal trainer spirit guide to help a client reach her sporting goals. Talking with an invisible friend you view as a positive role model, helps you practise healthy self-talk. The only time believing in spirit guides can be unhealthy is when we give them negative personalities, expect them to make our decisions for us, spend more time with them than we do our real people, or take the entire exercise just a little too seriously and literally. If a conversation with my spirit guide starts sounding negative or silly, I stop and go do something else, because I know I’m in the wrong headspace. As the Hawaiian saying goes- ‘Effectiveness is the measure of truth’. If it works, use it. If it doesn’t, don’t. I measure the value of believing in spirit guides on the basis of how balanced and healthy my life is as a result. In fact, I measure the value of any belief on this basis, seeing beliefs as tools, rather than facts to prove or disprove. After all, who know what ‘real’ really is? Anything could be possible. One thing I do believe in is the power of the mind and imagination! *Guides that vibrate at green frequencies like Archangel Raphael, guides and deceased loves ones who are/were healers (e.g. a nurse, midwife or herbalist), and/or have a strong connection with nature or work with plants (e.g. gardeners, environmentalists, horticulturalists, dieticians). *Some green shades are associated with musical or performing arts skills. Eg guides helping you with these skills or skills learned in past life. *If the blue-tinged green is lighter, it can represent teaching skills, dancing skills or a guide who is helping you be more present in the moment. Keep in mind that I experience the aura via the filter of my personal colour-associations, history and systems. All readers perceive the another person’s aura through the filter of their own (i.e. reading the aura is a subjective experience to some extent). But personally, I think you have a couple of young green dragons with you. You could think of these as archetypal metaphors for ‘fire energy in the heart chakra’: inspiring our passions as well as helping us connect with others in meaningful ways and build bridges in the community around us. PS light green makes the nature spirits more likely! Recently I had gone through some experiences with feelings of a presence. I actually took a photo of myself in the mirror one day and I had a white, almost transparent ball that was hovering my heart/chest. What would this mean to you? I am so interested in figuring this out. Thank you so much. It’s really important we find our own stories/perspectives on these things, and not take another’s word for gospel (even if they are a psychic!). I can tell you my impressions if you wish, but I would highly recommend doing the spirit guide meditation on this site, after spending some time gazing at the photograph. This way you can gather your own impressions first. Let us know what you discover!